Publishing this blog post the day before the release of the new Star Trek Into Darkness movie is pure coincidence totally planned from the start. 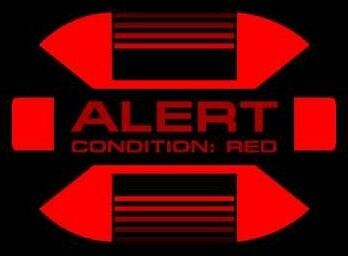 In the Star Trek universe, if a crewman isn’t standing on the bridge, face to face with an enemy torpedo barrage, a red or yellow alert message coming over the comm is the first indication that something’s wrong. Similarly, the alerts and notifications in AdWords and Bing Ads will often be the first indication that something is amiss in your account. So, set phasers to stun, raise shields, and let’s take a look at some notifications you might see in your PPC accounts. You’ll want to check both locations at least weekly, as I have found that sometimes there will be alerts in one location that are not shown in the other. If you see different alerts in both places, try clearing your cache to see if that fixes the incongruity. Now let’s take a look at some specific alert notifications you may find in your accounts. I focused in on AdWords alerts throughout the rest of this blog post, but Bing generally has the same types of alerts, phrased slightly differently. No ads running. You will usually see this if every campaign in your account has been paused or deleted for some reason. This can happen accidentally (if you’re bulk editing, for instance) or if you run out of funds (if you’re on the pre-pay payment plan). The easiest solutions are to check your billing information to make sure it’s correct and to un-pause at least one campaign. This can also happen if all ads in your account are disapproved. For instance, if all of your ads point to the same landing page and Google disapproved that page, your ads could be disapproved and none would run, triggering this alert. Your account has been suspended. This one is very scary. This means that you’ve repeatedly violated Google’s Prime Directive advertising policies. Depending on the policies you’ve violated, Google ­may indicate how you can fix your practices to re-activate your account. But there’s a chance that Google will not be forgiving, and you’ll no longer be permitted to advertise on the engine. Either way, contact Google support and try to work things out. This commonly happens with healthcare and with pharmaceutical advertising, as it is heavily regulated and monitored. If you sell over the counter medication or even supplements, be proactive and speak with your rep or contact support to find out the best way to avoid any issues. When alerts like these show up in your account, check the indicated campaigns and ad groups. For the no ads alert, it’s possible you’ve accidentally paused or deleted ads, or forgot to create ads when you made a new campaign or ad group. The no targeting message could occur if you’ve got an ad group in which all the keywords or paused, or a content ad group without any display targeting set. These are the friendly alerts. If such a thing existed on a Federation starship, I’d call them “Rainbow Alerts.” But that would be ridiculous, so I won’t call them that. When you see these alerts, make sure to check out the suggestions. You might not be able to increase your budget in response to an alert, but you can use the info as a springboard into a budget conversation with your boss or client. Adding relevant keywords to increase traffic is usually a positive if you have the funds to handle it, but carefully scrutinize the recommendations, since Google doesn’t know your accounts as well as you do. You may just find some low-hanging fruit from these alerts that would have you facepalming if you missed them. There you have it. This list of alerts is by no means exhaustive, but the alerts I’ve shared above are some of the most common ones we’ve seen. Make sure you take the alerts seriously so that your accounts are always running as they should be and you aren’t missing any opportunities. And boldly go where no (traditional) advertiser has gone before!